The Best Pen blogs from thousands of top Pen blogs in our index using search and social metrics. Data will be refreshed once a week. Bolingbroke, GA About Blog The best pen review site on the internet. Gel pens, Fountain Pens, Japanese pens, and more! Facebook fans 4,040. Twitter followers 2,661. About Blog Your home for pen, inks, papers, and general writing nerdiness. Facebook fans 2,749. Twitter followers 4,091. Oshawa, Ontario About Blog Fine pens & inks, funny cats, supreme paper, gadgets, and going green. Exploring delectable stationery and associated addictions. Facebook fans 7,850. Twitter followers 6,361. Riverside, CA About Blog Best Fountain Pen is where to find in-depth reviews of fountain pens including videos, photos and long-form reviews. Arizona, USA About Blog The Clicky Post is a pen review blog written by Mike Dudek. Facebook fans n/a. Twitter followers 2,291. Long Island, NY About Blog A pen blog, focusing on high quality reviews of the best fountain pens, best fountain pen ink, the best mechanical pencils, and the best stationery. Facebook fans 816. Twitter followers 3,265. About Blog The Well-Appointed Desk is a daily blog featuring inspiring work spaces, office supplies and paper goods so you, too, can have a well-appointed desk. For the love of pens, paper, office supplies and a beautiful place to work. Facebook fans 1,992. Twitter followers 3,355. San Francisco, CA About Blog This is a place for sharing information on Fountain Pens. A writing community for the novice to the collector. Facebook fans 1,131,192. Twitter followers 496,815. San Jose, California About Blog The JetPens Blog provides pen and paper reviews, artist interviews, and helpful tips and guides on how to get the most of your writing instruments. JetPens is an online stationery for people in pursuit of the perfect pen. Facebook fans 52,474. Twitter followers 18,017. Ashland, VA About Blog Fountain pen & ink reviews, weekly Q&A, product videos, gorgeous pen photography, inspiring artwork, and contests, brought to you by Goulet Pens. Their mission is to provide fountain pen enthusiasts with the most personal online shopping experience through comprehensive education & exemplary service. Facebook fans 34,402. Twitter followers 22,303. Mesa, AZ About Blog Learn about fountain pens and fine writing instruments. What's new. Whats hot. Which pen is the best. Pen Chalet is a retailer of fine writing instruments including fountain pens and inks. Facebook fans 4,836. Twitter followers 4,880. Edison, NJ About Blog The only thing we love more than writing instruments is writing! We created our own Z-blog to write about our favorite subjects - everything from A-Zebra! Manufacturer of pens such as ball point pens, gel pens, roller ball pens, mechanical pencils, markers, highlighters and refills. Facebook fans 179,560. Twitter followers 6,369. San Francisco, CA About Blog This community is dedicated to pens for pen enthusiasts. From fountain pens, to ball points, this is your place to converse about the best type of writing utensils. Facebook fans 1,131,191. Twitter followers 496,805. Appleton, Wisconsin About Blog Anderson Pens is your source for vintage & modern writing instruments, inks, pen repair supplies, stationery & more! We have over 36 years combined experience, and a lifelong passion for fountain pens! Facebook fans 5,054. Twitter followers 6,107. London, United Kingdom About Blog Find a huge range of luxury pens from brands including Parker & Cross at Pen Heaven. Pen Heaven is a personalised pen specialist based in north London. They offer a same day personalisation service, in-house, using our state of the art laser engraving machine. Facebook fans 1,632. Twitter followers 876. Wickford, Essex About Blog Welcome to Tiger Pens. We have a huge range of pens and pencils including gel pens, ballpoint pens, markers, mechanical pencils, rollerball pens, pencils, pen refills & pencil lead from manufacturers all over the world. Facebook fans 892. Twitter followers 2,734. Mesa, Arizona About Blog At Karas Kustoms manufacture high quality, hand crafted writing instruments, and made in the USA. Facebook fans 4,480. Twitter followers 1,692. Salado, TX About Blog The latest news and promotions from PenGems, where you'll find crystal pens in every color. Facebook fans 5,229. Twitter followers 1,390. Hitchin, England About Blog The Pen Company is a family run business that specialises in selling quality pens & pencils through our website. We stock a wide selection of pens and pencils from a child's first fountain pen to limited edition collectors pens. Facebook fans 2,123. Twitter followers 3,438. 20. Scribble Jot | Stationery. Fountain Pens. Ink. About Blog A stationery blog that features guides and reviews on stationery, including fountain pens, papeterie, and inks. Facebook fans 17. Twitter followers 11,732. Huron, Ohio About Blog Custom and Production Fountain Pens by Edison Pen Co.
Facebook fans 4,922. Twitter followers 5,446. South Holland, The Netherlands About Blog Fountain pen reviews, Serious Nibbage, Shootouts, and even more inky goodness. Facebook fans 330. Twitter followers 6,114. Davenport, IA About Blog Welcome to the Nibsmith, where every nib is treated equally and will be transformed into the best writer you’ve ever used! It’s my goal to adjust your pen to your exact preferences while providing you with the best customer service possible at a competitive rate. Facebook fans 4,085. Twitter followers 1,313. United States About Blog A blog about pens and other junk authored by Andrew B.
Philadelphia, PA About Blog At The Pelikan's Perch, you will find all kind of useful information related to dating pens, identifying models, a catalog of production, writing samples, and much more. In addition to this, you will find regular blog post including news, reviews, writing samples and more. Facebook fans 317. Twitter followers 658. Singapore About Blog I am a left handed fountain pen lover from Singapore. I am a video editor by profession but fountain pens and inks are my passion. Alt. Haven is where I publish my reviews. This is a collection of my thoughts and opinions. Somerset, UK About Blog All about pens, paper, pencils, art. Because you can't have too many of any! Facebook fans 508. Twitter followers 1,152. Hot Springs, Arkansas About Blog Newton Pens is providing a collection of Handmade & Custom Fountain Pens Since 2012. This blog is authored by Shawn Newton. His mission is to make good quality pens based at Hot Springs, Arkansas. Facebook fans n/a. Twitter followers 1,243. NC, USA About Blog I blather on about: pens, pencils, writing utensils. Mark-makers and the things they make marks on. That sort of thing. Facebook fans n/a. Twitter followers 1,290. Southern California About Blog Fountain pens, ink, paper, watercolor and more at Inkophile Blog. Facebook fans n/a. Twitter followers 2,318. About Blog It's not about the pencil case, it's about what's in it! The Pencilcase Blog provides reviews on the best fountain pens, pencils, pens, paper and inks! UK About Blog A blog about bridging the gap between the analogue and digital worlds. Spean Bridge, Inverness-shire About Blog High quality refills, nibs, pen kits and blanks for discerning pen makers. Specialist supplies for custom pens. Agents for Bock nibs. 35. From the Pen Cup | Who am I kidding…pen cups. As in plural. Central NY state About Blog I’m always searching for the perfect pen. Does it exist? Do I already own it? Let’s sort through the pen cups I have on my desk, in the kitchen, next to my comfy chair in the living room, in the bedroom, and in the craft/spare room, and examine the good, the bad, the losers, and the winners. Let’s face it, I own a lot of pens. I might as well write about them. Facebook fans n/a. Twitter followers 1,030. Kansas City About Blog Pen Place has been Kansas City's premier source for fine writing instruments and accessories since 1984. Great value & customer service on fountain pens, rollerball pens, ballpoint pens & mechanical pencils. Refills for fine writing pens. Facebook fans 1,609. Twitter followers 37. Virginia Beach, VA About Blog Fine writing instruments, office supplies & fountain pens. We specialize in pens at Virginia Beach. Facebook fans 320. Twitter followers 54. East Berlin CT, United States About Blog All the reviews and opinions are my own and I only review pens, ink and paper that I use, or have attempted to use. This site will give me a reason to use these pens and inks. I’ll be writing from my own perspective as I explore and learn. Glendale Heights, Illinois About Blog We restore and sell vintage pens and modern pens. We specialize in vintage Sheaffer, Parker and Esterbrook pens. We also sell Mont Blanc pens and other luxury writing instruments. Our pen repairs services are open to the public. Facebook fans 606. Twitter followers n/a. California, USA About Blog Pens & perspective for all hands, great and small Katherine, Pam, and Franz a trio of fountain pen enthusiasts who tries to make sense of the pen madnessWe hope to cover that gap, as well as have some large handed perspective! Facebook fans 111. Twitter followers 26. North East, England About Blog Get informed about all things pens with updates, new products, special offers and interesting pen facts all in one place. They offer a wide range of luxury writing gifts including branded pens such as Parker pens, Visconti pens, Montegrappa Pens, Diplomat pens, Fisher Space pens, Ohto pens, Platinum pens Waldmann pens, Waterman pens plus many more. Facebook fans 933. Twitter followers 130. About Blog My name is Laura, and I’ve been using fountain pens for, oh, it feels like forever. I blog everything about fountain pens, inks and the like. Kolkata, India About Blog A blog about all things fountain pens! Check out our site for amazing fountain pen and ink reviews updated almost every day! Facebook fans 30. Twitter followers 19. Perth, Western Australia About Blog I'm Yagan Kiely, a café owner. have over 400 bottles of ink I thought I'd make this blog to share what I have (as I wouldn't have gotten to 400 bottles without the reviews of others). Facebook fans n/a. Twitter followers 480. Rockville, Maryland About Blog Bertram's Inkwell specializes in upscale writing instruments. Bertram Oser is the owner of Bertram's Inkwell and selling the best writing instruments since 1985. Facebook fans 4,620. Twitter followers 1,640. Florida About Blog The purely random musings of an otherwise boring and normal person who is mildly obsessed with fountain pens. He is always open for collaboration and cross marketing opportunities. His mission is to learn, share what I’ve learned and positively contribute to the pen enthusiast community. Pacific Northwest, USA About Blog Fountain pens don't need to be expensive to be good. This blog celebrates economical pens that provide excellent writing experiences without the high price tag. About Blog I’ve always been a fountain pen user; for a time I was also a collector. A couple of years ago, I became a full-time restorer, mainly so that I could see and handle more pens. The pens are the ultimate documents of our hobby. There are no better learning tools than the pens themselves. Tokyo, Japan About Blog I run my own Pen Store and I am my only Customer. UK About Blog UnitedInkdom is a stationery news and reviews site, with a twist; as well as everyday news pieces, we do meta-reviews. The reviews posted here are compiled from reviews by knowledgeable, experienced fountain pen /ink/paper obsessives who have already carried out their own original reviews. Barrie, Ontario About Blog Your friendly pen, paper, and ink retailer, just north of Toronto. Online blog for fountain pen hints and tips, reviews and more. Facebook fans 275. Twitter followers 82. About Blog A place where I post my stationery reviews, Fountain Pens, Paper, Paraphernalia and Gadgets. Facebook fans 2. Twitter followers 1,549. Facebook fans 443. Twitter followers 57. About Blog I am a pilot for a large fractional aircraft ownership company and I love technology, pens, paper, and coffee. About Blog Ramblings as I unravel the pendemonium of using fountain pens, papers, ink and other analog tools in this digital life. Pendora's Box is a journey into the colourful and dizzying world of fountain pens, paper, ink and other analogue tools in our digital world. Saskatchewan, Canada About Blog My name is Cody and I am from Saskatchewan. I am a fountain pen enthusiast. Fountain pens, inky goodness, and pen hauls from around the world. Facebook fans n/a. Twitter followers 878. About Blog A blog about antique and vintage writing instruments: fountain pens, mechanical (propelling) pencils, dip pens, and more. Cleveland, OH About Blog For the frugal fountain pen enthusiast and collector. Curated by Tony Thomas, author of the bestseller, "The Fountain Pen Book". Facebook fans 14. Twitter followers 890. Towson, MD About Blog My name is Nick and I founded Fountain Pen Central because I recognize there is a need for high quality fountain pens that won't break the bank. Fountain pens and creating the beautiful calligraphy with them is lost art. This is why I bring some of the highest quality and affordable pens to your finger tips. Facebook fans 399. Twitter followers n/a. Silicon Valley About Blog A young man's journey into the world of fountain pens and calligraphy. Facebook fans 195. Twitter followers 172. Japan About Blog Blog by Bruno Taut providing useful information on Fountain pens in Japan. About Blog I enjoy trying new pens, experimenting with different combinations of pens, inks and papers and using pens from an expanding collection. About Blog have a passion for pens and journals (and then of course photography). I like trying new things...from pens to different kinds of journals and papers. About Blog A blog about fountain pens, written with fountain pens, by Scribble Monboddo. Lincolnshire, England About Blog Penbox is a luxury pens, inks, pen refills, pen nibs and writing accessories retailer, offering prestige pens, nibs, writing accessories and more. Penbox aims to supply individuals with a range of prestige pens, inks and writing accessories and has a retail and internet presence. Facebook fans 47. Twitter followers 97. United Kingdom About Blog The ultimate online channel dedicated to Vintage Fountain Pens. We upload videos that include reviews on vintage fountain pens - how to videos on how to carry out repairs on pens. We also add a fun element to some of our videos to make sure our videos can be enjoyed by all. Canada About Blog This is where I'll be posting my rants about pens, fountain pens in particular and drink some tea! 68. Fountain Pen Blog - Fountain Pen fans unite! About Blog This blog is dedicated to people who love fountain pens. You are welcome to add photos and videos and to start discussions about fountain pens. Facebook fans 8,979. Twitter followers 340. Millville, MA About Blog Neil's Pens is an online store for new and gently used fountain pens, rollerballs, ballpoints and mechanical pencils. Facebook fans 1,179. Twitter followers 228. About Blog Welcome to my Custom Fountain Pen blog. I put this site together a while ago so that I could let some of my fellow pen enthusiasts and penmakers. My goal, with each pen that I make, is to create a writing piece whose fit and finish will impress you when you first pull it out of the packing, and that will serve you well as a great writer when you fill it up with your favourite ink. Facebook fans n/a. Twitter followers 1,027. Birmingham, United Kingdom About Blog A blog about living on a narrowboat and touring the canals selling my handmade pens. Facebook fans 631. Twitter followers n/a. Melbourne About Blog Welcome to the Writers Pens! Based in Melbourne, we sell fountain pens, cartridges, ink, rollerball pens and more with free delivery throughout Australia from our website and eBay stores. We're sure you'll find your ideal pen! Facebook fans 146. Twitter followers 69. About Blog Fountain Pen Love Blog is about fountain pens, nibs etc authored by Andrea Kirkby . About Blog I am a fountain pen enthusiast who started writing with fountain pens in elementary school using the dipped variety. I’ve started to collect and try new fountain pens, ink, and paper and wanted to share my experiences. This website is about the enjoyment of owning and writing with a fountain pen, reviews, and tips to help everyone find the best fountain pen and have a fun writing experience. CONGRATULATIONS to every blogger that has made this Top Pen Blogs list! 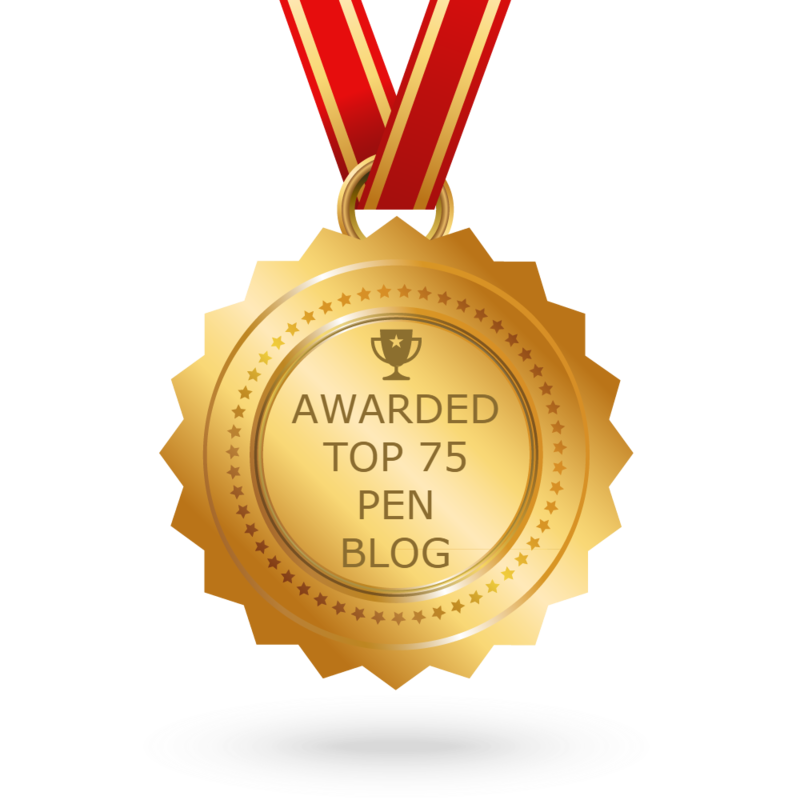 This is the most comprehensive list of best Pen blogs on the internet and I’m honoured to have you as part of this! I personally give you a high-five and want to thank you for your contribution to this world.